Buy Persicaria bistorta 'Superba' bistort: Showy spikes of pale pink flowers. This plant loves damp soil! Dense spikes of soft pink flowers rise from midsummer to early autumn above semi-evergreen, deeply veined, mid-green leaves. This clump-forming, vigorous perennial has handsome foliage and quickly makes dense groundcover in sun or partial shade. Plant it in bold swatches to add vertical interest in the border right through till mid autumn, and give it plenty of space. 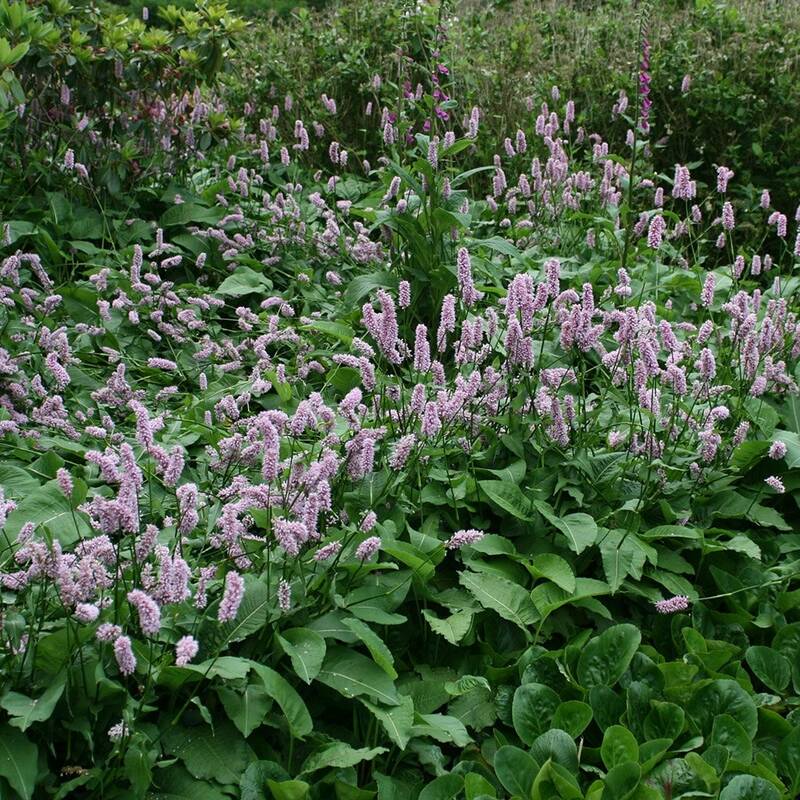 Persicaria does not like dry soil, so performs best in a bog garden or beside a pond. Bees and other insects love it too! This is a good basis for the border. Love this plant.Makes my border look quote professional.I don'thedo high maintenance so is ideal. A fantastic, vigorous plant that's a joy to behold. 2 months ago this plant had completely died back to the ground after winter (so very much deciduous in Manchester! ), and now it's a huge mass of lush green leaves with a few dozen pretty pink flower spikes. We can go up to it at pretty much any time of the day and find several bees working it, which my 2 year old daughter loves to watch. It's really flourished in one of my boggier beds and the sheer vitality of the plant really is something to see. Fully deserving of the RHS merit award. Yes, you could create a bog garden for them by planting them over a pond liner or plastic sheeting, but do make sure there are a few holes poked in so some water can drain away. Also, while these plants are tolerant of light shade, they tend to flower best if they are grown in a sunny spot.